Some clouds exhibit peculiar structures just like vertebratus clouds. These clouds rarely occur in the sky and if they do, you will surely be awed by its appearance. Let us consider how this cloud formation develop, appear and what it tells about the weather. Vertebratus is a Latin word for vertebrae, which meaning articulated or jointed. They are so named because vertebratus clouds are clouds that look like vertebrae of the spinal column. These clouds are exclusively found in the cirrus genus and are characterized by having cloud filaments extending outwards from a lengthened central core, appearing like fish skeleton. The Vertebratus cloud slowly forms in the sky as it is blown out by winds creating cloud filaments in both sides of the column. At What Height is Vertebratus Clouds Found? Since it only appears in cirrus genus, then it can found in the upper cloud level. Depending on the geographic location, the upper cloud level can be anywhere between 16,500 feet and 45,000 feet above the Earth’s surface. And because the atmospheric temperature decreases as height increases, the upper cloud level is colder with temperatures below freezing point. Therefore, vertebratus cloud is primarily made up of ice crystals and does not produce precipitation. However, they may thicken and start to develop into a weather system. How does a Vertebratus Cloud Form? Vertebratus forms when air moves parallel to the primary cloud line. 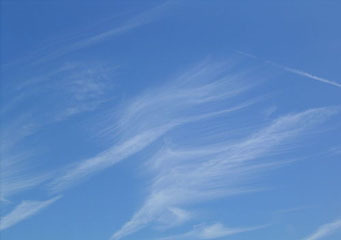 The spaces occur in areas of sinking air while the ribs or cloud filaments extending outward are created by rising air. Normally, vertebratus clouds start out as smooth strips of ice crystals. Wind shear causes the ice crystals to be blown away crossways producing fine cloud streaks or filaments. Their occurrence in the sky signifies the region called jet stream, the transitional area between the troposphere and stratosphere. Deteriorating jet contrails sometimes look like vertebratus clouds as well. How do Vertebratus Clouds Look Like? As the name suggests, vertebratus clouds closely resemble fish bones or spinal column floating in the sky. Because they are largely made up of ice crystals so they appear in white color. Although the cloud variety vertebratus is exclusive to the high level cirrus genus, it may also appear in middle cloud level known as altocumulus mackerel sky. Mackerel sky looks like scales of mackerel often in light gray color and slightly thick than cirrus vertebratus. This cloud is a good indicator of advancing cold frontal system. How common are Vertebratus Clouds? Vertebratus clouds rarely form, but they can exist in most parts of the world. Make it a habit to spare some minutes observing cloud formations. Who knows, one of these days, you may witness the rare vertebratus clouds appearing in the sky.